Welcome to Sepia Scenes this week! I will select a few of your posts to re-post here on my blog for everyone else to see. So post your best! Don't forget to visit your fellow bloggers! The look is of the town square or green from a century earlier. A beautiful sepia! As a collector of clocks, this is one I would definitely like to have relocated to my front room. Quite nice, a timeless look to it all. The roman numerals on the clock give it an old fashioned look and the sepia gives it age too. The picture could easily have been from an older town square. Great job! 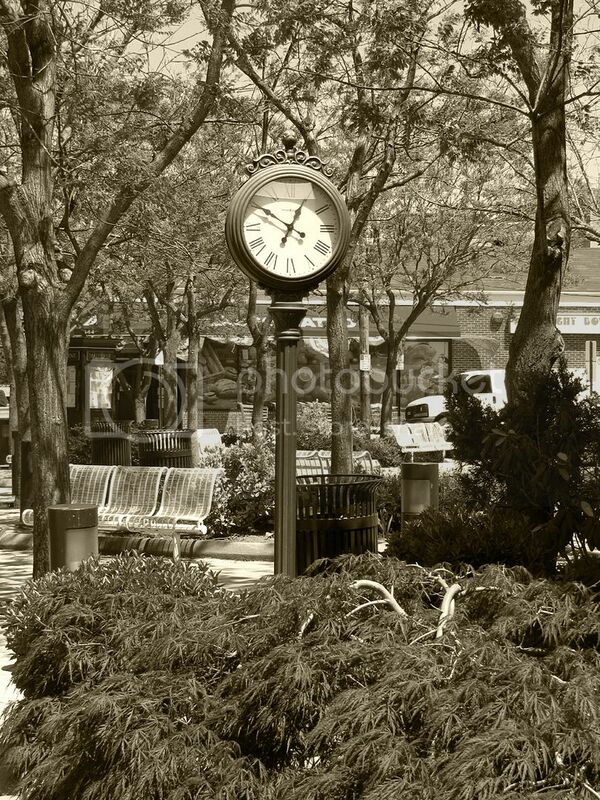 I just love clocks in Sepia--perfect. what a wonderful editing :) perfect! Lovely! Clocks are so fascinating for some reason...I love the tree[s] at the header, too! I think the clock might not be that old. The Rotary clubs around here installed three of them in the past five years or so. The sepia forces us to look at the clock as the main attraction of the photo and distracts our attention from the bins that are also in there. Very well done! It looks like "time stands still"